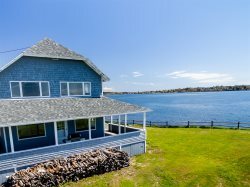 Nestled in a canopy of green with beautiful westerly views from Broad Sound to Casco Bay, Bober Cottage has 185ft of private shoreline that offers the perfect setting for your getaway to the coast of Maine. You’ll love the privacy of this property, easy access to coastal restaurants, and a full service marina for endless adventures. Inside the cottage, you will find a fully equipped kitchen, a full bathroom with a walk-in shower, a second floor master bedroom, and a tiny first floor bedroom with twin bunk beds (ideal for children), and a comfortable living room to enjoy the stunning sunsets over the bay. Outside, you’ll find Adirondacks and a stone fire pit overlooking the ocean. A lush lawn with a stairway leading to a rugged shoreline is a perfect place to hunt for sea glass, swim, or simply sit and enjoy the view. We encourage all guests to visit www.bobercottage.com to view many more photos and to learn about the history and surrounds of this beloved retreat. Bober Cottage does not have a washer and dryer, but there is a laundromat in Brunswick, just 20 minutes away. Bottled Water- This property has a private well, so you may prefer bottled water. Soaps & Detergents- Dish soap, sponges, inside trash bags, and paper goods may be in the cottage and can be used. We recommend that you check the property for these items before purchasing them at your local store. Paper Towel & Toilet Paper- You will receive a complimentary roll of paper towel and toilet paper when you arrive, as well as a trash bag to get you started, but all guests are responsible for these items during their stay, unless they are found at the cottage, in which case guests can help themselves.